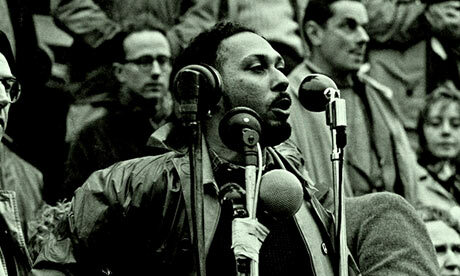 I knew Stuart Hall, who died recently, from the Centre for Contemporary Cultural Studies in Birmingham, and remained in touch in the years that followed. We need to reclaim Stuart from those who would turn him into a leading academic in the field of Cultural Studies, although this is not to in any way to deny his enormous influence in that field. Stuart did not see himself as an academic but, when pushed, would say he was an intellectual, referring to Gramsci’s concept of the organic intellectual: somebody who would strive to counter the dominant hegemony. Stuart would have mocked so many of his obituaries as they try to present him as anything but the black revolutionary that he was. Crucially, Stuart was born in Jamaica when it was still a British colony and whiteness was so much preferable to blackness. He came to the UK, in fact to Oxford University, when he was 19, where he did not feel at ease. He lived in Britain for the rest of his life, but as Martin Jacques accurately highlights in his obit (Observer), Stuart never felt at home here. He saw himself as an outsider. In fact, it was his blackness and foreignness, a black man from a British colony, mixed with his early embrace of Marxism, which gave him his unique view of British society and of the lasting ideological and economic grip of Britain’s imperialist past. He felt, he told me, that even those on the left whom he worked alongside regularly did not perceive how crucial were his blackness and ‘otherness’. What Stuart said also defined him were the events of 1956, primarily the Soviet invasion of Hungary, but also the imperialist spat over the Suez Canal, evidence of Britain’s continuing militaristic world pretensions. It is easy now to view the Soviet Union as having failed, whatever the explanation offered. But it was hard to break with the Communist Party in 1956: one only has to compare Stuart’s break with the CP from Eric Hobsbawm’s continuing membership. Stuart became a key figure in the New Left marking his ideological break with Stalinism. The Universities and Left Review, first published in Spring 1957, only one year after Hungary was edited by Stuart Hall, Gabriel Person, Raph Samuel and Charles Taylor. The editors saw it as a risky venture, when the Cold War caused ideas to be inappropriately compartmentalised into opposing sides, in an atmosphere of continuing paranoia. From the outset, ULR signalled the need for an awareness that capitalism in the UK had changed from the 1930s: for the first time it had come to be dominated by what Stuart later called ‘the social-democratic’ paradigm. ULR explicitly signalled that it wished to discuss socialist ideas which were neither Stalinist nor ‘welfarist’. Stuart’s article in the first issue is presciently called: The new conservatism and the old. ULR merged with the New Reasoner in 1960 to form New Left Review, Hall was named as the founding editor. Stuart was deeply involved in CND in the 1960s (meeting his wife, Catherine, herself as outstanding historian, on one of the marches). He was involved in the ill-fated May Day Manifesto group of 1968. In the 1970’s, he took over at CCCS. His early emphasis on the importance of ideology to the ability of the dominant/ruling class to hold onto power – Stuart wanted to ‘bend the stick’ away from any form of economic determinism- opened up and legitimated what is now coined ‘cultural studies’. Out of this focus, emerged his influential analysis of ‘Thatcherism’ which he saw as a combination of the ‘free market’ and social conservatism, a perspective criticised at the time for its failure to emphasise class resistance and its therefore pessimistic implications. Stuart is also associated with the now fashionable emphasis on identities (including sexual), an awareness a consequence of his own diverse parts. One of the earliest CCCS studies he is associated with, Policing the Crisis, emphasised the continuing salience of racism towards young black men by different agencies of the State, coercion increasing with the increasing crisis in capitalism. Stuart and others led the way in arguing that the concept of mugging was an ideological construction used by the media, police and judiciary, which presented black youth as the problem in the popular consciousness. A later work, The Empire Strikes back: Race and Racism in 70’s Britain, although it did not include Stuart’s own work, drew heavily on his ideas: that increasing racism, which was often ‘hidden’ was in part a product of the organic crisis in British capitalism. A less well- known CCCS study: Unpopular Education, a joint production, analysed the shift away from a social democratic paradigm in the education system. CCCS, under Stuart, regularly published stencilled papers written by their students. Under Stuart, the aim was forms of collective authorship between students and staff: such work was seen as less individualistic and undermining the usual approach of a hierarchy of knowledge. Stuart’s ideas became the seedbed for many a future academic. Stuart was always keen to consider new ideas and his emphasis on the importance of ideology can be seen as opening the door to a dismissal of the importance of class, a position however that he would never have himself adopted. His position was Gramscian, not Althusserian. But Stuart, despite his considerable influence in the opening up of what was then the new academic field of cultural studies, did not uncritically embrace its many adherents. His concern was to confront capitalism and to destroy it. While an analysis of class relationships does not lie at the forefront of his writing, and we may not always agree with all the nuances in his approach as to what constitutes class, I would argue that his understanding of the changing relationship between the classes provided the bed-rock of his analysis. The ruling class would attempt to cling onto hegemony by whatever means necessary, consensual or coercive. He became associated with Marxism Today in the 1980s, which was presenting a Eurocommunist position. MT carried his work arguing that Thatcherism represented a new political formation, a response to capitalism in crisis, and a drastic lurch rightwards which represented a re-alignment of class forces and a political defeat. Thatcher’s mix of neo-liberalism with Tory paternalism was a winning potent. The implication of Stuart’s position was the need both for broad alliances and ideological struggle. While Marxism Today can be seen as providing an ideological cover for Labour’s further moves rightwards and further away from the working class, Stuart, more than its other contributors, insisted, in a sometimes contradictory fashion which characterises his work, that he maintained the centrality of the working class. Stuart, until illness caught up with him, was also deeply committed to and active in the anti-racist struggle. In the last months of his life, Stuart was still writing and working on the contradictions of ‘common-sense consciousness’ and how this helps to explain how working people come to accept the increasing inequalities and barbarities of this Coalition government. I first knew Stuart when he was my tutor at CCCS. It was the year of the Grunwick strike and, after submitting a motion to the weekly staff-student meetings, I brought the Centre to a standstill for all the major picket days. They even paid for a mini-bus to take people to the picket line. The Centre’s emphasis on praxis i.e. that theory is practice, infuriated me and my stand certainly annoyed a vocal minority at the Centre, but not Stuart. We stayed in touch after that and I last saw him about a month ago, when we discussed, of course, the character of class. I will miss his deep warm laugh, keen intellect and infinite generosity of spirit. Despite his seriously failing health, he fought to stay alive, wishing to complete his autobiography (inevitably aware of the limitations of such an enterprise) for his grandchildren to read. It is now up to us to continue the fight for the overthrow of capitalism. This is a nice obituary, and one that rightly focuses on and celebrates Stuart Hall’s political and intellectual radicalism. However, to hail Hall as a black ‘revolutionary’ seems to me to be mistaken. As Stephen Philip pointed out in his obituary for Socialist Worker, Hall’s political framework, certainly by the 1980s in the face of Thatcher, was shaped by the politics of building ‘broad democratic alliances’ in the traditional manner of the Popular Front type politics of the Communist Party. Such politics can not be described as ‘revolutionary’, even if Hall did still hold on to some sense of the centrality of the working class as the agent of change. This quibble aside, thanks for an insightful obituary.